After lunch yesterday, Kate and I spent almost three hours relaxing in our family room. It was a cool overcast day, and I made our first fire of the year. I don’t think we had more than one or two all last winter. I put on some music and began my previous post while Kate worked on her iPad. After two hours, she rested on the sofa though she didn’t go to sleep. When she got up, we talked about going for an early dinner and how pleasant the afternoon had been. We also talked about all the good times we have had. As so often happens, she then asked my name and our relationship. Once again, she was surprised that we were married. We talked a little more and then started to walk toward the garage. She stopped and with a puzzled look on her face, she said, “I don’t even know who I am.” I told her I could help her and picked up her “Big Sister Album” that her brother Ken had made for her. I showed her one of her baby pictures and her name. Then I turned to a page with our wedding photos and read the accompanying information to her. She was delighted and wanted to take the album to dinner with us. I suggested we leave it at home and go through it later. When we got home after dinner, she wanted to wait until today. On the way home, she expressed her confidence in my driving and thanked me for taking such good care of her. I told her that I do it because I love her. I should say that I not only do things to care for her, but I have paid particular attention to cultivating a relationship of trust. 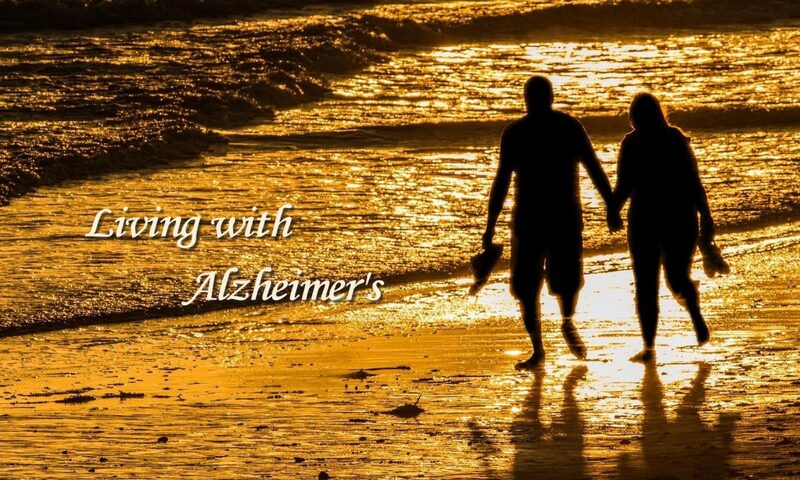 I tell her I love her far more than I ever did before Alzheimer’s or even the early years after her diagnosis. I put an emphasis on this about two or three years ago. Prior to that we light-heartedly joked with each other. She was never one to joke, and over time, her jokes began to sound like more serious charges about my trying to control her life. When I noticed that, I backed away from almost all joking with her and adopted the approach of a more loving partner in her journey. I think that has paid dividends as she has become more dependent on me. She still talks about my trying to control more than she would like. She did that last night, but she also is able to say that she knows I do that with good intentions. I sense that she recognizes my desire to help her no matter what happens. I believe that is reflected in her expressions of appreciation that are becoming more frequent. For quite some time, I have said that we are a team and that we face everything together. Sometimes she uses that term when we work together on something. For example, last night I gave her my hand as she got out of the car. When she got up, I said, “You did it.” She said, “We did it. We’re a team.” She occasionally says something similar when I help her get dressed. As we walked in the house after dinner, she asked what she could do. I told her I would see if there were something on TV that he might enjoy. I also mentioned that she could work puzzles on her iPad. She liked the idea of puzzles. She worked happily until I told her it was time for us to go to bed. Yesterday was another relaxed day and a very nice one. Even though we had no commitments for the day, I got Kate up before she was ready. Our housekeeper was at the house, and I also didn’t want to eat too late in the day. Fortunately, Kate didn’t make a fuss at all about getting up. She responded to me as though she recognized me. She didn’t ask my name or who I am. She gladly accepted my help with dressing although she did most of it by herself. On the way to lunch, I played a CD of familiar show tunes. She sang along with several of them. I was surprised at her memory for the lyrics. She didn’t get them perfectly, but she did a pretty good job. She also surprised me as we left the restaurant. We were about to step off a curb when she said, “Take my hand.” I immediately sang the phrase “Take my hand; I’m a stranger . . .” She finished it by singing “in paradise.” I was surprised again. That’s an old song, and one that we haven’t heard in many years. Later after we had returned home, she picked up something that belonged to our housekeeper thinking it was ours. I told her it was the housekeeper’s. She said, “My bad.” I don’t ever recall her using that expression before, and it is obviously of a more recent vintage than the old songs she was singing earlier. Once again she had surprised me. I continue to believe Kate derives a good bit of pleasure from the puzzle pictures themselves as well as the satisfaction of completing them. She often asks me to look at a puzzle after she has finished it and comments about the colors or how cute the animals are. She has two or three that she works over and over. Both of them are pictures of kittens. One is very colorful. Kate like that. She likes the kitten in the other one. This happened several times while we were at Barnes & Noble yesterday afternoon. Her intuitive abilities are alive and well. After dinner last night, I turned on the last of the Clemson/Notre Dame game and planned to watch the Alabama/Oklahoma game. As so often happens, my plans changed. Normally, Kate works her puzzles until time for her to go to bed. As I have mentioned before, she is encountering a little more frustration with her puzzles now. There have been a number of occasions in the past several weeks that she has simply put down her iPad and sat without doing anything. That is what happened last night. I saw that she had stopped working her puzzles and knew that she needed a break. I suggested that I find a YouTube video with some music. She liked the idea. I found a series of Andrea Bocelli videos that she enjoyed. That was followed by an old “Christmas in Vienna” concert with The Three Tenors. She watched all of it and was thoroughly entertained. That was an hour. It led to several additional videos of Bocelli with other musicians like Lang Lang and Sarah Brightman. Kate was so engaged that she didn’t want to go bed but did so at my urging. So what about football? The truth is that I didn’t have a stake in either game, so I didn’t consider it a great sacrifice to give them up. In addition, I also enjoyed the music as well as watching Kate being so engaged. I hope that we will be able to enjoy music together for a long time. It’s a pleasure for me to live in the moment with her. It is also another example of how important intuitive abilities are to both of us. They provide moments of joy I did not expect when Kate was diagnosed. After Mary left yesterday, Kate and I went to Barnes & Noble. She was working puzzles on my iPad since we couldn’t find hers. I think she must have left it in Mary’s car when they went to lunch. Because she was using my iPad rather than her own, she had a different selection of puzzles. This may have confused her. She didn’t know how to start. I opened a display of several puzzles and asked her to choose one. She didn’t know how. I opened one for her. The way the puzzles work is identical to those she has worked on her own iPad, but there have also been occasions when she didn’t know how to open a new puzzle on it as well. She was unusually talkative. As she worked her puzzles, she repeatedly talked about how nice it is “that they have these things (the iPad and my laptop) while you’re waiting.” She didn’t realize they belonged to us. She acted like she had never seen them before and wanted to know who made them. I was trying to think of a simple answer and said, “Steve Jobs and Apple.” I don’t know why, but she got the impression that I had played a role in the development of “these things.” I tried to tell her that I didn’t have a part at all. I was just explaining who did. Then she said, “But you had a role in helping me understand it.” I appreciated her acknowledging that I help her a lot, but I didn’t want her to underestimate her own talent and receptivity to technology. That led me to remind her that as a school librarian/media specialist that she was using personal computers (the Apple II) before I did. She gravitated from the iPad and laptop we were using to the changes in technology that had occurred during our lifetime. She didn’t mention anything specific, but I picked up on her comment and recounted some of the technology that had come on the scene since we were in college. She was quite engaged with the topic. She also kept coming back to how nice it was that “they” (Barnes & Noble) provided the iPads and laptops to people while they are waiting. After dinner, I watched the evening news while Kate worked on the iPad. After forty-five minutes, she stopped. She found the puzzles too frustrating. I suggested that I put on a YouTube video with music. I found a Andrea Bocelli concert. She loved it. It saved the evening for her. Prior to that she was feeling low over not being able to work her puzzles and having nothing else to do. She was clearly rejuvenated by the music. She had gotten so keyed up that she no longer felt tired. We went to bed anyway, and, fortunately, she had no trouble going to sleep. I have previously mentioned that Kate’s Monday sitter, Valorie, has been able to help Kate get up, showered, dressed, and to lunch. That was a great step forward for me in that it meant I didn’t have to do that before the sitter arrived. I could let her sleep and know that Valorie would be able to handle everything. There is another benefit for Kate in that I don’t have to rush her to get ready. Neither of us likes that. Until yesterday, I had not had the opportunity to see if Mary, the Wednesday and Friday sitter, might also be able to assume a similar role for Kate. I wasn’t concerned about Mary’s ability, but I wondered if Kate would be willing for Mary to help with these personal matters. I received a call from the agency on Wednesday asking if we could change the time of Mary’s visit yesterday to 11:00 to 3:00 instead of 1:00 to 5:00. That presented a good opportunity to see how well it might go. The next step was to see if Kate slept late. She usually does, but she sometimes surprises me by getting up as early as 7:30. As it turned out, Kate slept until thirty minutes before Mary arrived. I got her to the shower. Then she went back to bed. When Mary arrived, I took her into the bedroom to let Kate know that she was there. Mary told Kate to let her know if she could help with anything. Kate said she would. I gave Mary some instructions and left it with her. When I got home, I discovered that everything had worked without a hitch. I specifically asked Mary if she had helped Kate dress. She said she had asked Kate if she would like help, Kate said she did. Then I went back to Kate and asked if Mary had helped her dress. She said, “No. Why should she? I can do that myself.” Although it is possible Kate didn’t want to say that she had help, I believe she just couldn’t remember. After all that had been almost four hours earlier. She often forgets things in seconds or minutes. Even though it worked well, I may not be calling on Mary to play this role often. The reason is that she doesn’t arrive until 1:00. On most days, Kate is up and dressed before that. On the other hand, she sometimes sleeps until 1:00. There are also times like today when Kate has gotten up and showered, but she is not dressed. Whatever happens I feel good knowing that I can rely on Mary for help. As I expected, we had a rather quiet day yesterday. Kate slept until almost 11:00. She was in a good humor and smiled at me when I walked to her bedside. At first, I felt that she must have known me. I asked if she were hungry. She was and wanted her clothes. I pointed them out on the chair right next to the bed. She asked me to help her up. She sat up on the side of the bed. I got her clothes. As she started to dress, she looked up at me and said, “Who are you?” I told her my name. Somewhat hesitantly she said, “Are you my husband?” I told her I was. When she was ready to go, we went to lunch. The only question I recall her asking was the name of the restaurant. I can’t be sure that she remembered my name and/or that I am her husband. She didn’t ask. After lunch, we came back to the house where we relaxed almost an hour before going to get our hair cut. Apart from one small incident, she didn’t seem confused. That occurred after the stylist cut her hair, and I took my turn. I had given the iPad to her in the waiting area while I went to the back of the shop. In a few minutes, she came looking for me. She indicated that she didn’t know where she was to go. The stylist told her she could stay in a chair near me or that she could go back to the waiting area. I couldn’t hear exactly what was said, but Kate ended up staying in the waiting area where I had originally left her. I think that she had forgotten where I was and just needed to know. The rest of the day was rather laid back. We came home and relaxed for a while before going to dinner. When we returned home, I watched the evening news while Kate worked on her iPad. Kate went to bed early but did not go to sleep. I was up later watching the first half of the Baylor/Vanderbilt game. When I got in bed, she was still awake. Much of the time she had been in bed running her fingers through her hair. She said that she was “making progress.” Otherwise, she seemed perfectly normal and didn’t get up at all during the night. Yesterday was a travel day for us. Kate made it easy by waking before 10:00. That allowed us to meet Jesse and her family at 11:30 at Panera to say our goodbyes. We visited while Kate and I had lunch. It was a nice way to end the visit, one that I believe was our last in Memphis. It was cold and beautiful when we left and throughout the drive back to Knoxville. That made the drive an easy one. In addition, the traffic was not as heavy as I expected. We ran into one trouble spot. It must have been an accident. We were nearing an intersection and noticed two things. The traffic was coming to a stop and that some of the traffic in front of us was exiting the highway. We did the same. We stopped to get something to drink and checked my Waze app. It showed the problem spot and a path around it. We took it, and it worked. I’ve only used Waze a few times before. This time it really helped. Our only other stop was in Memphis for an early dinner. That added another hour to the trip, but it was good to have a break. Kate didn’t say much on the entire drive home, but she was very relaxed and content. We don’t have much on our agenda today. We get our hair cut this afternoon. It’s Thursday but not a night for music at Casa Bella. We’ll just relax. That’s probably a good thing. I have already felt more at ease since being at home. There are always things to attend to with Kate, but they seem to increase when we are traveling. I’m just thankful we were able to make the trip and that it went so well. On all our previous trips to see Jesse and her family we have gotten up early, or at least not late, on Christmas morning. That meant “really” early when the children were younger. As they’ve grown older, we have been ready to open presents between 8:00 and 10:00. This year was clearly different. Ron and Randy knew all the presents they were going to receive, so there were no surprises in store. In addition, Kate’s sleeping pattern caused us to get together whenever she was ready. Since we were not eating our Christmas meal until 5:00, I let Kate sleep as long as she wanted. She got up close to 1:30, and we arrived at Jesse’s at 3:30. I had told them to go ahead and open their presents, so it didn’t affect their plans. That made for a very short, but nice, day for us. We enjoyed being with Jesse and Greg as they prepared the meal. Most of the time the boys were upstairs playing with their new Christmas presents. Jesse’s turkey turned out to be superb, just the way it has been the past couple of times she has cooked it for us. At the end of the meal, we took our plates to the kitchen. Jesse asked Kate if she would like her to take her plate. Kate accepted. As Jesse walked to the kitchen, I said, “Isn’t it nice to have your daughter take care of you like that?” Kate said, “My daughter?” I said, “Yes, your daughter.” She said, “What’s her name?” Before Jesse returned to the room, she asked her name two more times. Despite that, Kate handled herself beautifully. She participated in our conversation and didn’t say anything unusual. She didn’t walk around the downstairs rooms again, but she did comment on how beautiful the house is. It wasn’t long after dinner that we came back to the hotel where we relaxed over an hour before Kate wanted to go to bed. She was in bed by 9:00. That should bode well for her getting up earlier today. We plan to meet Jesse and her family either at the hotel or some other place for lunch and then leave around 1:30. I had wondered for a long time if we could make this trip. I am glad to say that it worked out well. It was very different from those in the past. We had considerably less time with Jesse and her family than before. Some of that arose simply because we stayed in a hotel rather than at their house. Just as important was the fact that we paced ourselves. I don’t think we were all together more than three hours at any one time. That was good for Kate who usually likes to do something different after a couple of hours. Kate was able to enjoy herself. There was only one time when she seemed a little restless. That was yesterday afternoon just before we ate. For more than an hour, we had been sitting at the bar looking over the kitchen while chatting with Jesse and Greg as they prepared the meal. Kate got up and walked into the family room. I followed her. She asked me when we were leaving. I told her we would go right after dinner. Apart from that, she appeared quite comfortable if not enthusiastic. Of course, she had been very enthusiastic about Jesse’s house and Christmas decorations our first night there. As for future travel, I believe I will limit it to one-night stays. I’m not sure how many of those we will have. If Kate continues to sleep late, going to visit Ellen in Nashville becomes a little more challenging. If we stayed overnight, that would make the trip less rushed. At the moment, I am not planning anything. I’ll just see how things unfold in the months ahead. The only family event that I know of that could prompt another trip is to Texas is our granddaughter’s high school graduation. I would like to make that, but I don’t believe it is in the cards for us. I hope I am wrong. It’s Christmas morning, and I am thinking about all the households with young children who have been up for hours and eagerly unwrapping packages. Those are great moments to treasure. They don’t last forever. The children often sleep a little later as they get older. Life changes for all of us as we age. We don’t celebrate the season in the same way we did when we were younger. One thing doesn’t change. We still have our memories of Christmas. I remember getting my Red Ryder BB Rifle when I was about nine or ten years old. It’s hard for me to believe that my parents allowed me to play with it around the neighborhood at that age. I also remember being excited over the Schwinn Black Phantom I received when I was twelve or thirteen. Those were among my most special Christmas gifts as a child. The memories of the Christmas season that mean the most to me these days are the ones that Kate and I have shared. We had our first date on December 19, 1961. We went to a performance of Handel’s Messiah. December 19, 1962, we became engaged. On Christmas day six days later, we announced our engagement to Kate’s extended family at the family Christmas gathering at Kate’s home. Over the years, we have enjoyed the season in different ways and in different places. We spent our first Christmas together with a trip to my home in West Palm Beach. That was Kate’s first time there. We spent our only Christmas alone in Madison, Wisconsin, during my first year in graduate school at the University of Wisconsin. I have many treasured memories of Christmas Days we spent with each of our families. Until the children were around five or six, we rotated between our parents’ homes. After that, our parents came to us. As our children graduated from college and started their own families, we followed pretty much the same custom. We were introduced to the pleasure of watching grandchildren enjoy Christmas with the excitement that is unique to children. Kate and I also started taking vacation trips during the first or second week of December. Three or four times we have enjoyed the Christmas season in New York City. That’s my favorite time of the year to be there. We have also enjoyed Christmas season travel to London, Paris, Vienna, and several places in Germany. This Christmas we find ourselves in a very different place. Next year we won’t travel to be with our children and their families. There is no way for me to know exactly what Kate will be like next year, but she is likely to continue her decline. Kate no longer has the memories of Christmas that have been so special to us. I tell her about them, and she experiences momentary pleasure in being reminded. She can’t, however, retain and reflect on them. I am sad about this. I’m sad for her, and I’m sad for me; however, there is still good news. Even though her world is growing smaller, she continues to enjoy life. I know from other caregivers that moments of pleasure often continue for a long time. Whatever happens, I retain my memories of Christmas and the joy we have experienced during this season, and I am grateful. My wish for you is that you continue to create your own Christmas memories to treasure now and for the days to come. Merry Christmas. We had a nice day yesterday. It matched the activity level we have at home. We got out and had good times with Jesse and her family, but we had breaks that make it easier for Kate. She got up before 10:30. That got us off to a good start. I don’t like having to wake her. That worked well for our plans to meet Jesse, Greg, and the boys for lunch at a new diner downtown. We met them at 12:30 and had a good time as well as a good lunch. Kate got a very large Turkey Club sandwich. It was about 4” high. I thought she might have trouble getting through half of it, but she ate “the whole thing.” She did it her way starting at the top slice of bread, pulling off one layer at a time and working her way down to the bottom. She wasn’t unusually talkative, but she enjoyed herself. All of us had a good time. It was after 2:00 before we left. Jesse asked if we wanted to go back to their house or to the hotel. I decided to go back to the hotel for a little break and join them at the house around 4:00. Breaks like that seem to work well for Kate, and Jesse needed to run some errands. I tend to think of these breaks as something solely for Kate, but I also think they are for me. When we are in social situations, I feel a bit of pressure to be attentive to her as well as to enjoy myself with those we are with. After the break, we returned to Jesse’s house for about an hour. Once again, Kate took great interest in the house. She made the same circle from room to room that she had done the previous evening. For her, it was like the first time she had seen it. She told me that it looked “much better than when we lived here.” That was almost identical to something she had said about our own house a couple of months ago when she took an hour going through it the same way she did at Jesse’s. As the sun began to set, we went to see the Christmas lights at a seniors nursing facility a twenty-minute drive from their house. They have a large piece of property circled with a light display that Jesse described as “tastefully tacky.” As a fund raiser, they open the yard to the public. I expected Kate enjoy it more than she did. She didn’t say much. It was certainly nothing like her reaction to the décor and Christmas decorations at Jesse’s. From there we drove back into town for dinner at a small Italian restaurant near Jesse’s home. It’s a great neighborhood restaurant. We’ve eaten there quite a few times over the years and enjoyed it. It was perfect for last night. When we got back to Jesse’s, it was 8:00. I thought it was a good time for us to say good night. We went back to the hotel where I watched a portion of the Broncos/Raiders game while Kate worked on her iPad. She was in bed before 9:30 though she was still awake when I joined her at 10:00. It had been a nice day. Shortly after I had explained to Kate that Karen is our daughter and Lee is her husband, she shifted her focus to our relationship. She was happy and said, “I am beginning to feel normal again.” I asked her to explain what she meant. She stumbled on her words, but said, “I am feeling at ease, and I attribute that to you.” She also thanked me “for bringing me here. If it weren’t for you, I wouldn’t be here.” She went on to say how much she appreciated my patience with her and how that helped her to feel relaxed. Over the next twenty minutes to our hotel, she continued to express that sentiment. In some of her comments, she noted how many things I do for her that she can’t do. I don’t think she was speaking specifically about things she couldn’t do because of Alzheimer’s, but that is the way it sounded. When we got to the hotel, she said, “You are my best friend. I feel I can tell you anything. I trust you.” This was mixed with an extension of the conversation we had had in the car. She reiterated how relaxed she is with me. Twice she said, “I feel we just connect, and we haven’t known each other that long.” I started to tell her that I was her husband and that we have been married fifty-five years but decided not to say anything. At various points I thought she knew me as her husband. At others I wasn’t sure. I do know that near the end of our conversation she said, “What’s your name?” To me this was a dramatic illustration of the power of feelings over her rational mind. It is also a reminder that it is only a matter of time before she won’t remember either my name or that I am her husband, but I will treasure moments like this one. She was happy, and although I felt a touch of sadness, I was happy for her.